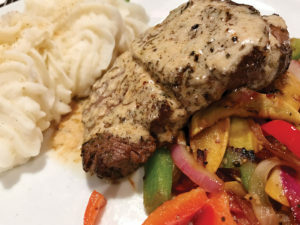 No one knows for sure which central Iowan invented steak de burgo, but CITYVIEW readers will soon have their say as to which local eatery serves the most savory. Food is the new politics. Both subjects inspire intense loyalties that are usually only shared by a minority. Just as Alexandria Occasio-Cortez fans can’t comprehend how anyone could support supply-side economics, deep dish pizza fans can’t understand how others could prefer tavern-style pizza. If anything, food arguments are more splintered than political ones. That’s probably because every human has a unique combination of 2,000 to 8,000 different “taste buds,” each of which can be more or less sensitive from one person’s tongue to another’s. Those different combinations are as distinctive as fingerprints, yet most people want others to like eating the same things they like to eat. At CITYVIEW, the First Amendment is our favorite. We love a good argument. We leave the complexity of political polling to Gallup, Rasmussen and Ann Selzer. However, to determine a consensus about more intricate local tastes, we instigated the Ultimate Food Challenge in 2010. Each summer we have begun a poll to determine Des Moines’ favorite sandwich, steakhouse, pizza (twice), burger and pasta. These competitions whittled our fields down to a single popular favorite. This year, we are asking you to select Des Moines’ best steak de burgo, a dish that is uniquely identified with Des Moines. Filet (tenderloin) of beef is cooked to order and served with a sauce that might differ considerably from one place to another. Almost every Des Moines restaurant that serves steak serves a de burgo variant. A few others in Iowa do, too. It’s pretty much unheard of outside Iowa. (The big exception is that Eric Ziebold, who has won James Beard Awards on both coasts — French Laundry and City Zen — makes a deconstructed version. He is an Ames native.) It does resemble “Greek style” or “zip sauce” steak of Detroit and Mason City, and steak with chimichurri in the southwest, Brazil, Uruguay and Argentina, but it is its own thing. it has been theorized that clever Catalonians changed their aoili’s name rather than its recipe. Perhaps this spread to Francis Avenue and inspired Vic and Johnny to their great creation. Vic’s son is Jerry Talerico, who began the Sam & Gabe’s restaurants that carried forth his father’s recipe, with butter substituted for olive oil. That is common now. The late Henry Schneider of Iowa Beef Steak House and The Pier explained that this way: “Iowans like the flavor of butter better. Plus, it’s cheaper.” Talerico sold Sam & Gabe’s a few years ago, and it’s been resold. The recipe has changed with cream being added at one time. They have gone back to the original recipe, though. They also serve de burgo chicken wings. Cream sauce de burgo is a Greek American invention that originated at Johnny’s Vet’s Club in Des Moines. Both it and chicken de burgo are quite popular in Des Moines now. Some restaurants (Rusty Duck) even serve both styles, butter and cream. Steak is Iowa’s heritage dish. The aroma of freshly cut meat searing quickly over an open flame is a primal scent — one that encouraged our human progenitors to straighten their spines, walk on two legs, fashion spears, and invent fire. During the second half of the 19th century, beef steak became an international obsession and status food. It transformed the American range into the world’s largest feed lot. Between the Civil War and 1880, Midwest cattle populations increased 30 times over. Because Iowa’s fertile soil grew the most grain, the state’s fatted cows produced the gold standard of this new food economy at a time when food drove all economies. For a century, the status of Iowa beef extended to New York City steakhouses and beyond. In 1959, Des Moines’ Harry Bookey, then 11, told Russian Premiere Nikita Khrushchev that the U.S.S.R. might have an edge in satellite technology, but our beef was superior. Khrushchev, a staunch Russian chauvinist, conceded the point to the young debater. Coincidentally, Bookey would become both a lawyer and a restaurateur in Des Moines. When Khrushchev visited Des Moines, Iowa beef represented the culmination of one of the great romances in the histories of both agriculture and human migration. After Europeans got word about the fertility of Iowa’s black soil, immigrants flocked across oceans, mountains and hostile forests to realize the American dream of owning land from which they could make a good life. By the end of the 19th century, they had made Iowa a rich state built on fields of grain and pastures of plenty. That wealth was sustainable and a source of pride. Fields produced corn in such abundance that farmers fed it to cattle that grazed their youth away in clover. Those corn-finished cows moved short distances to packers and lockers. Our steaks were Iowan from birth to aging rooms and famous for their superior marbling. By 1970, about 70 percent of Iowa farmers were raising cattle. Iowa led the nation in beef production between World War II and the 1980s, peaking in 1969 at seven million head. Big changes came in the 1980s. Because fossil fuels became cheaper and Iowa farm land more expensive, it was more economical for packers to ship grain out west and finish cattle there. Former cattle ranches in Iowa were plowed over and planted with government-subsidized corn and beans. By the end of the 20th century, most industrial beef came from multiple plants, multiple states and even multiple continents. Today less than a fourth of Iowa farmers raise cattle. Our feedlot population sets a post-World War II low almost every year. Iowa has slipped to the No. 9 cattle state, trailing six states with large tracts of cheap, open range, plus Missouri and Kentucky. nostalgia at a class reunion. These old culinary symbols of Iowa represented the proud final link of the great 19th and 20th century food chain that stretched from Iowa cornfields and cattle barns to the dining rooms of the best-fed people in world history. Steakhouses became touchstones to a collective longing for halcyon days when corn was used for the sustenance of superior livestock, not to fuel cars, sweeten soft drinks or add cheap filler to practically every processed item one can find in a supermarket. Steakhouses are also touchstones to the farms and small towns from which many of Des Moines-area families moved. Three-fourths of Iowa counties peaked in population more than 110 years ago while the Des Moines area grew continuously. Steakhouses used to cover the state. In smaller towns, they often became surrogate country clubs and were the nicest places in entire counties for people to celebrate special occasions of life. Archie’s Waeside in Le Mars became a bona fide foodie legend with its dry aging room, two James Beard Awards, a garden and nearby landing strip for private planes. These are this year’s entrants in the Ultimate Food Challenge. Irina’s is a Russian restaurant with Russian dishes like pork shaslik, salmon Wellington, beef strogonof and chicken Kiev balanced with American dishes like rack of lamb, Alaskan halibut and Iowa duck. The appetizer menu is more European with several dishes of mussels, clams, shrimp and calamari starring. Steak de burgo is the superstar here. Irina’s version is made with two medallions of tenderloin in a buttery sauce with a touch of cream, herbs and garlic. The restaurant also has the best vodka collection in Iowa, with flight deals on some occasions. The carrot cake stars on the dessert menu. Fleming’s is an all prime, aged steakhouse from Paul Fleming, who is also the P.F. in P.F. Chang’s. Everything here is lavish, from the seafood towers that include lobster, king crab, shrimp cocktails and tuna poke, to truffle poached lobster with caviar, Kurobuta pork tenderloins and gargantuan wine cellars. Steaks are offered with several different butters and classic European sauces, plus de burgo. You can order any cut from a petite filet to the 20-ounce ribeye. Miso glazed sea bass stars on the beyond steak menu. The menu calls it “the original,” and we do not dispute that. 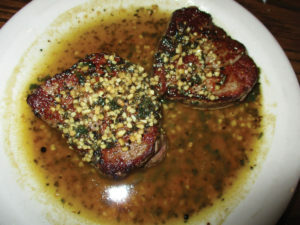 Their de burgo is made with butter, basil and garlic with medallions of tenderloin. They now have two locations — one in Urbandale and a new one in The Lyon in East Village. Both feature live music. The Lyon has great views. Pasta is a strong suit here, with Sophia a local icon. Veal, salmon and halibut also liven up the non-steak menu. This new player in Waukee evolved from a food truck. They are the only local place regularly offering wagyu beef, from Lost Hills Farm in Lucas. Wagyu is the cow from which Kobe beef is made. It’s known for being highly marbled, flavored and tender. Their cows are pampered, having only one bad day in their lives. Gastro serves de burgo poutine and a menu of trendy foods like roast cauliflower, bone marrow with bacon jam, fried brussels sprouts and truffle fries. The Range is another new dining room and sports bar with a hook — and a slice. You can rent a simulated golf range and play 18 holes on the world’s most famous courses. If this were a clubhouse, it would be an exclusive one with an upscale menu that includes Niman Ranch pork, prime aged beef, bison, elk and scallops. There is white wine in the creamy de burgo here, and it can be ordered with any entrée. Yanni’s is a Greek and Italian place that serves souvlaki, spanakopita, moussaka, dolmades and gyros of both lamb and chicken, as well as lasagna and six other pasta, several homemade. They host a popular buffet five days a week that costs less than $10. Their steak de burgo is made in wine with garlic, mushrooms and basil sauce. They include a generous 10 ounces of medallions. Shrimp, chicken, veal, walleye and mahi mahi also appear on an eclectic menu. Mama Lacona’s is one of the traditional Calabrese eateries of Des Moines and is now located in a gorgeous venue of Italian marble and state-of-the-art window technologies. Probably most famous for their pasta and pizza, Mama’s serves chicken versions of saltimbocca, spedini and marsala. Their de burgo includes two 5-ounce medallions in a garlic butter sauce of mushrooms. They feature early bird specials. This popular destination dining legend in Dexter has been packing folks in for pasta, pork loins, Italian fried chicken, seafood and award-winning burgers. Rather than disappoint half of central Iowa’s de burgo fans, they make it both ways — with a garlic cream sauce or a butter and wine sauce with garlic and basil. Both are huge full-pound servings of tenderloin. Christopher’s is another of the oldest Calabrese restaurants still thriving despite fires, floods, embezzlers and other unlucky setbacks. Famous for 10-hour roasted prime rib and pan-fried chicken, pasta and pizza, they have anchored fine dining in Beaverdale since 1963. They make their de burgo with the garlic cream sauce in Italian herbs. specialization in things that meant more to America six decades ago — pink squirrels, grasshoppers, silver clouds, brandy Alexanders, pork tenderloins, scratch-made strawberry shortcake, open-faced steak sandwiches, thin onion rings (that keep winning Best of Des Moines awards), cavatelli, spaghetti and meatballs, daily specials for lunch and dinner, and discounts for Happy Hour. Their de burgo is made with butter, Italian herbs and lots of garlic. As of press time, it was a Thursday-only special. includes beef tenderloin, chicken breast and shrimp. was the chef at Johnny’s Vet’s Club before he opened his own place. He learned the “Greek” de burgo there and now uses it with both chicken breast and portobella as well as beef tenderloin. Chef’s is legendary for their hashed browned potatoes, so much so that their fans pushed them to open for breakfast on weekends. They also are well known for their pot roast sliders, eggplant lasagna, Greek salad and clam chowder. and short ribs glazed with root beer and cherry stout. Their de burgo uses sirloin instead of tenderloin and is rolled in peppercorns. Candy bar pie and Snickers bread pudding keep the menu eccentric through dessert. Sam and Gabe’s is THE BEST Steak de Burgo ever!! How is Simon’s not on here?!?!? You missed a great one in Simon’s! In town. I’ve yet to find any as good as theirs was. I’ve had them all, you missed the very best one! Olympic Flame hands down has the best!! Thanks. Chefs Kitchen has original recipe from Vets Club era. Tursi’s Latin King. Has the best Steak de Burgo in the State of Iowa. I have been going there since I was a child. This was before Bobby Tursis owned it. I will not eat this any where else. Sam and Gabe’s has the best steak De Burgo in town hands down. The steak melts in your mouth! Sam and Gabe’s has the best De Burgo!!! The Rusty Duck in Dexter gets TWO votes! I had the cream de burgo and my husband, the butter ..both were incredible!! Steak de burgo originated from, Johnny, from Johnny & Kay’s Hyatt house many years ago. It is no longer open. Others are versions of his recipe as he created it long before say, Latin King. I’m fortunate that my father in law was friends with Johnny and had the original recipe – yes butter, garlic wine and cream but no other recipe has his particular herbs.